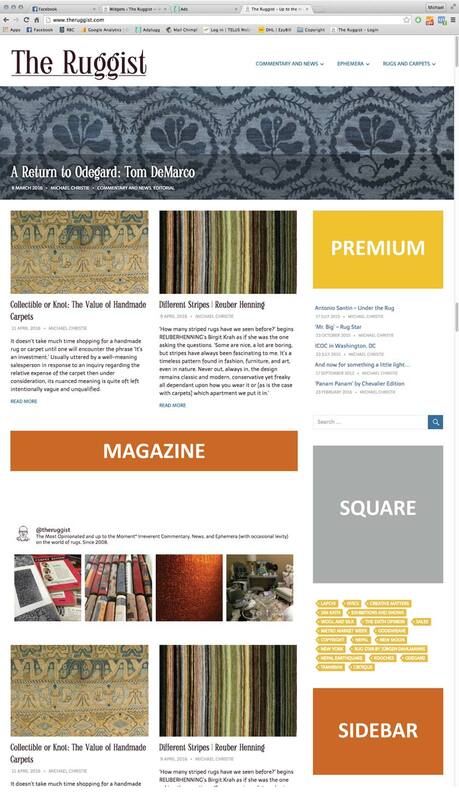 The Ruggist is the premier online source for carpet and rug news, design commentary, insightful editorial, and honest reviews of handmade decorative carpets and classic oriental and Persian rugs. Tailored for the well informed consumer, designer, and architect as well as rug industry insiders, The Ruggist covers the high end as well as the middle markets with a strong focus on quality design and value, superior workmanship, and originality. If that sounds like something you want to be part of, make sure your clients know by advertising on The Ruggist. *Quoted pricing is based on annual advertising commitment; six month and monthly rates are higher. All pricing in United States Dollars. **Guaranteed placement ensures your advertisement appears in a single preferred location on The Ruggist while still in rotation with other advertisements, subject to a 15% surcharge. Facebook placement inserts your advertisement into Instant Articles published by The Ruggist on Facebook at no additional upcharge. Click here to see a sample advertising layout. Our goal is to help sell rugs and carpets and promote the best of the industry. Our thoughtful and insightful editorial, news, commentary, and more, is focused on the handmade and decorative rug and carpet industry. Our prose is somewhat embellished and hyperbolic, but always truthful and up to the moment. While it would be grand if The Ruggist (and truthfully any media outlet) could exist without advertising, it is simply not the way of the world. Advertising pays for (making circular hand gestures) all of this. The dilemma, particularly with the sad state of most online advertising is that it is hideous, annoying, and obtrusive. We here at The Ruggist hate that as much as the next person and so our approach is different. First and foremost is that we present our articles to readers in the manner in which they would like to consume them. Desktop, tablet, mobile, it doesn’t matter. The Ruggist delivers our widely acclaimed (if not also occasionally reviled) content beautifully, in full colour, and since April 2016 with stunning high quality images. This is not an adjunct service. The Ruggist is an online magazine and presents the same feel one has come to expect from quality print publications, only in a format appropriate for today and accessible to most audiences. Furthermore, we actively promote ourselves across several channels of social media to ensure maximum exposure not only for us, but more importantly you, our advertisers. We want people to know we are proud you support us, and we feel you should take pride in supporting critical thinking, education, and the advancement of handmade rugs and carpets. So now, ask yourself: Do you enjoy reading The Ruggist? The role of advertising in media has been debated since time immemorial. OK perhaps not that long, but you understand. There is trepidation regarding advertisers as they are the ones of course who pay the bills, and just like in politics, you just have to follow the money… . The Ruggist strives to uphold a high standard of editorial discretion while acknowledging the demands of paid advertisers. Paid advertisers will always (and rightfully) make demands. Some such as preferential editorial consideration and event sponsorships are rational, others such as preferential editorial consideration and willful omission of critique, irrational. The Ruggist is loath to skirt issues or critique deemed important to us (and obviously the industry) simply because a paid advertiser would rather it not be discussed. We deserve better, the industry deserves better, and it is our goal to deliver as such! That notwithstanding, let us not fool ourselves with a rose tinted Instagram filter. Everyone has their own biases and The Ruggist certainly is not claiming otherwise nor to be immune from such an affliction. We tend to write about praiseworthy items when praise is warranted and of course critique items when – while not necessary – we feel like it. Over the last seven years the tone and style of The Ruggist has varied, but the core message of not taking ourselves to seriously has remained. Enough already, tell me how much it costs! We’re all the same aren’t we? Cost is a factor when choosing where to place your advertising dollars but so is the benefit. The benefit is exposure, brand awareness, and since we’ll be talking all the time because you’re late submitting your advertisement, perhaps more editorial exposure on The Ruggist. It’s not that we like our advertisers more, it’s just that we know them better and they actively tell us things. Things we can tell other people about…. But I digress. Advertising rates start at: $150/month with an annual commitment. It’s not just an exchange of money for advertising space however, we work with all of our advertisers to ensure they receive maximum value for their dollars spent. In short: It’s custom advertising tailored to your needs. Preferred placement and advert delivery options are available.